A fireman involved in a fatal crash while responding to an emergency call should have slowed down near a junction, a court has been told. Leteef Kadri Sheikh, 52, of Marlow Avenue, Luton, died in hospital a month after the car he was driving was hit by a fire engine, Luton Crown Court heard. 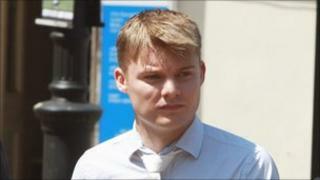 Robert Hulatt, 28, of Bromham near Bedford, denies causing death by dangerous driving. Prosecutor Beverly Cripps said Mr Hulatt should have slowed down. She said the fireman had had no view of part of the junction. Mr Sheikh, who was in the car with his wife and three daughters, suffered chest and brain injuries and died in October 2009 almost a month after the collision. The family was on the school run in their Vauxhall Astra on 11 September 2009 when the accident happened. The jury was shown CCTV footage from a nearby pub of the crash that happened at the junction of Chapel Street and Windsor Street in Luton. The jury was told that Mr Hulatt, of Browning Close, was at the end of his night shift when he received an emergency call to a house fire. Ms Cripps said: "As it [the fire engine] approached the junction, the lights were red. "In this case, you have no proper view of what is happening to your right until you are actually on the junction. "While we accept that those who are engaged on a emergency call can go through traffic lights, they have to do so in a manner which doesn't cause any difficulty to other road users." Judge John Bevan told the jury dangerous driving was defined by driving which falls far below what would be expected of a competent and careful driver, and that it would be obvious to a competent and careful driver that it was dangerous.